Zevin Asset Management and Women Investing for A Sustainable Economy share a mission with Take The Lead Day 11/14 in a Boston workshop. Meet an Ohio leader, author and Take The Lead Day partner changing the futures of girls in leadership across the country. Meet the doctors and scientists making a difference in their work and research. As in don’t just talk. As in make it happen. The team behind Powertopia and Take The Lead Day is doing that and taped a video of "Women We Know You Want to Know." 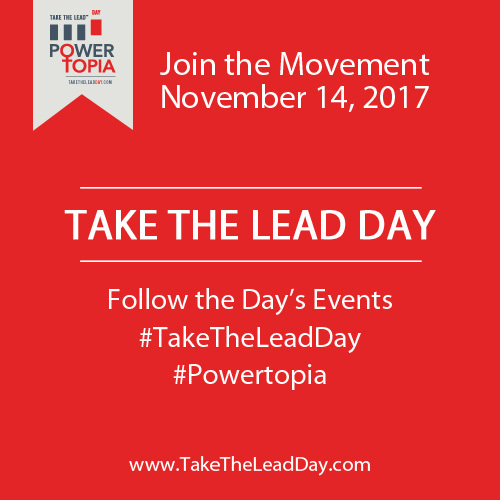 Embrace your power for Powertopia, Take The Lead Day November 14, by hosting an event for the 24 hours of action to move women to gender parity in all forms of leadership by 2025. Get started here on our website with all the supporting tools to promote your action here. Have we come a long way? Watch this documentary from Retro Report on the origins of sexual harassment at work and decide. Author Laura Beth Nielsen, presenter at Take The Lead Day in Chicago 11/14, takes the mystery out of the process. A recent book examines the centuries-old mistake of saying women are less than. How not to let fear interfere with your career. Expand your entrepreneurial expertise in different directions for financial security. Read this latest white paper on how improving the economic status for women is best for all. We are that movement. We are Pow*HER*ful because we are unified by a common goal to achieve gender leadership equality by 2025 - 70 years ahead of the trajectory. We are Pow*HER*ful because we stand together in action, fighting every day for our daughters, our sisters, our mothers, our friends, and ourselves. SPONSOR a workshop and become a Take The Lead Partner — meet our power partners here and contact us to learn more.